Here's a shot of the inside of our transmission after Nationals 2001. The arrows pretty well tell the story of what happened. That hole leads to the bellhousing and the clutch. This is the front differential. 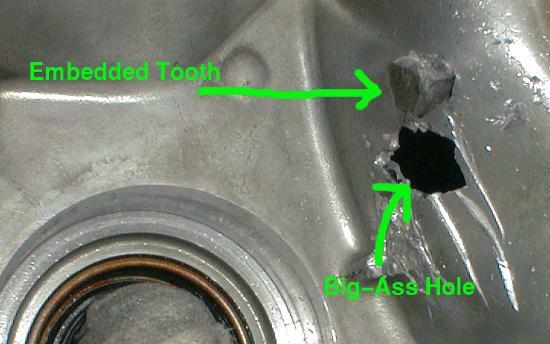 The arrow indicates one of the missing teeth, that was torn clean off the side gear. There's also some dings and dents where the teeth bounced around inside the case for a while. But to further cushion the driveline, we've also installed this nifty carbon fibre driveshaft, built by ACPT. It replaces the front two sections of the stock shaft, and provides some extra flex and shock absorption so we won't be pounding the gears quite so hard at launch. It also weighs 14 lbs, cutting about 20lbs off the weight of the driveshaft. The stock tail section and carrier bearing is pictured just above the carbon shaft. 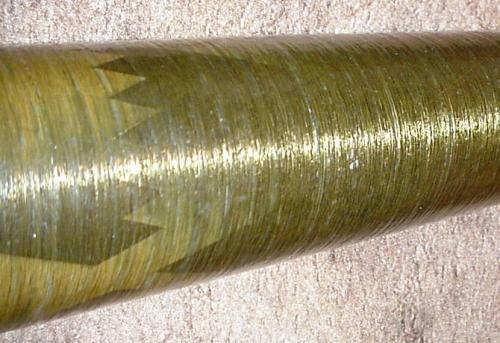 Here's a closeup of the detail of the weave on the shaft. So then, here's the $2000 question - did it work? Well... that depends on your definition of "work". In terms of protecting the diffs from self-destruction, no, it did not. Diffs (specifically, the center diff) continued to break from time to time. 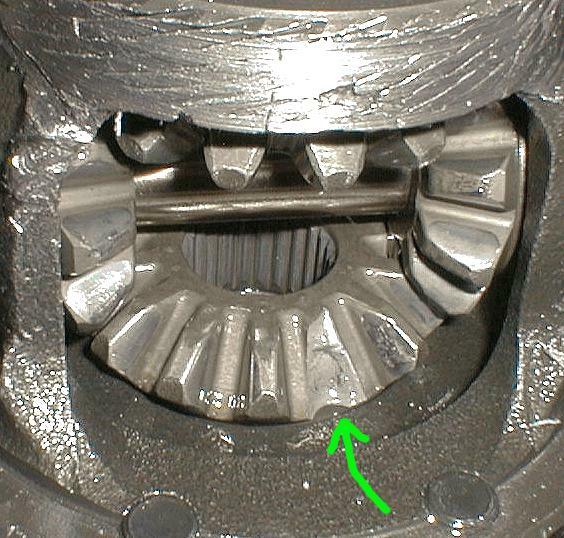 Switching back to an organic clutch face helped too, but the bottom line was that the CF driveshaft did not protect the transmission in any measurable way. That's not to say it didn't help, but we kept breaking centre diffs and there was no way to measure if the driveshaft was helping other transmission components to live longer. The driveshaft functioned perfectly well as a driveshaft, and it was a good deal lighter than the stock shaft. Being two piece instead of three piece, it also eliminated a carrier bearing. But I have no data anywhere that proves it provided any other improved function over the stock piece, aside from considerable weight reduction. That's not exactly a failure... but not a success either. If you're considering one of these pieces, I recommend it for the weight reduction and bling factor, but for nothing else.